Giroud suffered the injury in Arsenal’s 2-2 draw away to Everton in their second Premier League match of the 2014/15 campaign. The forward underwent surgery in August and was expected to miss out for up to four months, however Wenger has claimed Giroud is recovering well. 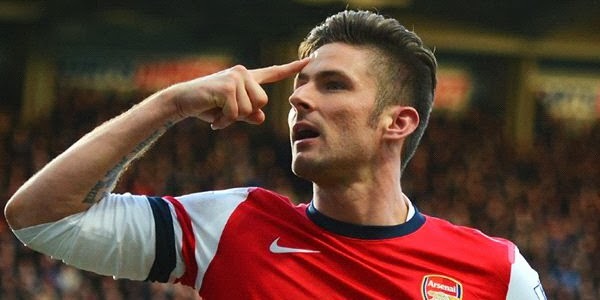 Giroud joined Arsenal from the French side Montpellier in 2012 and scored 16 goals last season for the Gunners, as well as two goals in four games this campaign. Wenger signed Danny Welbeck from Manchester United to account for the injury to Giroud, although the club have won just two of their first seven league games this term. Arsenal are already without numerous first team players through injury, including the likes of Aaron Ramsey, Mesut Ozil, Mathieu Debuchy and captain Mikel Arteta. Theo Walcott is expected to be fit soon for Wenger’s side, having missed 10 months out through a knee injury sustained in the FA Cup win over their closest rivals Tottenham in the FA Cup.